After apparently selling out the Belasco Theatre in LA last month, Party Thieves is hitting the road on his Max Capacity Tour, where the DJ’s first headlining run of 2017 is an alternative to the average tour - four-stops, 300 person capacity venues and all free admission. 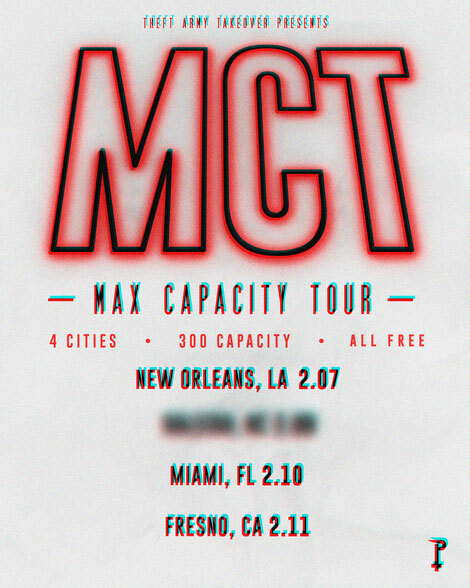 The tour will start in February in New Orleans, then stop through Miami and an unannounced city before capping off in Fresno, California. With a limited amount of shows and tickets, Party Thieves aims to create intimate environments where those in attendance can enjoy his music. Every member of the producer’s #TheftArmy will be amongst other clubbers in potentially sweaty, jam-packed spaces, perfect for bass-fueled nights filled with slashing synths and dirty trap beats. Party Thieves: “I’ve had the urge to meet and just genuinely party with my most loyal fans - no tickets, no complicated promoter contracts, just free shows and intimate memories that these fans will be able to share forever. “I’m basically throwing a meet&greet tour to give back to this community. A lot of artists are caught up in making money, but I’m just caught up in having fun with the people who support me."